There is something unique and special about the process of smoking meat. No other form of cooking comes close to getting the flavor, the aroma, the delicious taste you are able to obtain by properly smoking your meat. And while traditionally the meat smoking process has been known to be hard and tedious work, the new line of electric smokers on the market can turn any beginner into an expert meat smoker overnight. Easy to use and able to obtain extraordinary results with minimum of effort, the best electric smokers on the market are all the rage now due to their amazing features that turn what used to be a tedious process into an enjoyable and hassle free experience. Follow us while we review the best electric smokers on the market and present you our top 10 best electric smokers list, carefully curated after going through countless electric smoker reviews. This comparison table of the highest rated electric smokers will give you a preview of the top models on the market, while in-depth reviews follow shortly below. 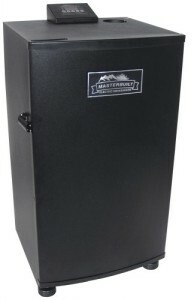 Masterbuilt 20070910 electric smokehouse is our top pick for the best electric smoker. It’s available for purchase at a reasonable price, one of the few high quality electric smokers under $200 and has a two and a half cubic foot capacity, more than enough even for the most enthusiast meat smoker. The exterior is made of powder-coated steel ensuring durability and reliability in insulating from external temperature even in extreme weather conditions. The interior houses 4 smoking racks, a side loading wood tray, a drip pan that can be easily removed for cleaning and a grease pan mounted in the back. The temperature is controlled electrically through a thermostat and a digital control panel, and the electric smoker automatically shuts off ensuring there is no risk of overcooking and burning the meat. 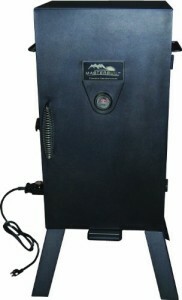 This is our most recommended electric smoker and we encourage you to purchase it wholeheartedly. 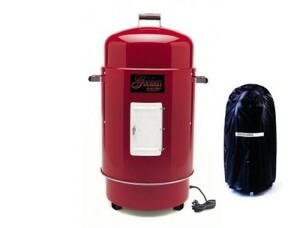 Masterbuilt holds the prize for the second best electric smoker as well, this time with their 20070411 model. 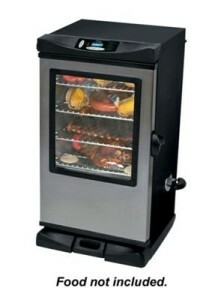 This model differs significantly from the previous model due to its viewing window and internal light, which enables you to check the status of the smoking process at all time without the need to open the door and expose the meat to external air currents and fluctuations in temperature. It’s available in two sizes, 30 inches or 40 inches electric smoker, ideal for those that want something a little bit bigger. In addition to all the features presented in the above model, this Masterbuilt electric smoker also features a built in meat probe. The smoking racks are coated with chromium. This model is a little bit more expensive, slight above $200, but it’s well worth the money if you have the budget for it. 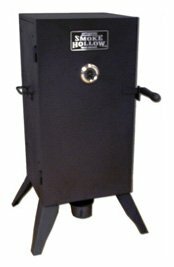 Masterbuilt 20070210 analog electric smoker is a smaller electric smoker, housing only 3 smoking racks but still features all the essential benefits of the best electric smokers such as thermostat-controlled temperature and comes with wood-chip trays, water pans and grease pans included. Still, the cooking area is around 550 square inches, enough for a great picnic in the family, and the temperature ranges from 100 Fahrenheit degrees up to 400 F, and can be gauged through the display on the front door. 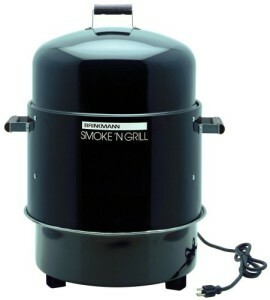 Brinkmann is the first electric smoker brand other than Masterbuilt to break our top 10 electric smokers list and we have to say that the Smoke-N-Grill 810-5290-4 model does not disappoint. Although this model is available as a charcoal smoker as well, we highly recommend that you choose the more efficient electric smoker. Brinkmann’s electric smoker can act just as well as an electric grill and features wooden handles that stay reasonable cool even when smoker is heating up. Comes equipped with 2 cooking grills and is able to smoke up to 50 pounds of meat in one go. The base pan consists of lava rocks able to deliver up to 1500 watts for your cooking. 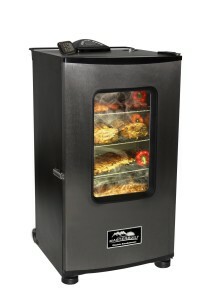 Masterbuilt 20070512 electric smoker is another model equipped with a viewing window and features additionally a remote control for setting and adjusting the temperature or the light from a distance. 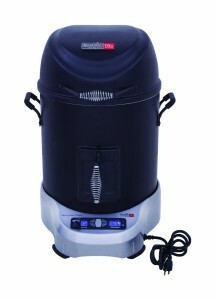 This is an extremely portable electric smoker, with a built-in wheel and a safety handle for easy moving. Comes in 2 sizes, the 40 inches model being able to house over 900 square inches of smoking space. 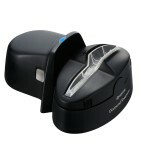 There is a backlit digital display mounted on top for recording the temperature, the light and the time and assist you with the smoking process. Bradley got in line with the times, and upgraded their old smoker line with this 4 rack digital smoker ideally suited for outdoor barbecues. You have full control through the digital panel not only over the temperature but also over the amount of smoke used and the duration. This digital smoker is capable of some unmatched performances, such as the 8 hours controlled cool smoke and it’s ideal for chefs or for those that prefer gourmet food to impress their guests. It’s a little bit expensive, costing over $300 even through our discount link above, but for those that prefer a luxury electric smoker this is the model to buy. This Brinkmann electric smoker is comparable to the model reviewed at position 4 in our top 10 electric smokers list, but there are a couple of differences that we did not like. This model is available as a charcoal model as well, and you can purchase it with or without a cover, although we highly recommend you use an electric smoker cover for maintenance. 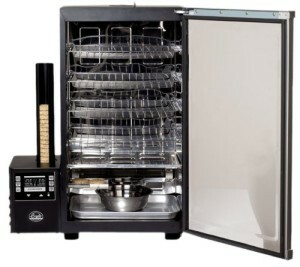 Features a front-hinged door, a procelain-coated water pan, and if you buy exactly this model through our above link also comes with a vinyl electric smoker cover included. Char-Broil comes with an award winning infrared electric smoker that aims to keep the meat as juicy and as flavored as possible through its 100% infrared heat. 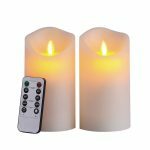 It has quite a small capacity for our tastes though, only 16 pounds, but it has been highly rated by its dedicated fans due to its quality. The highest rated electric smoker on Amazon, with an average rating of 4.6 out of 5, the Smoke Hollow 30162E electric smoker has a small but dedicated base of loyal owners that swear by its quality. This is not as fancy as the other electric smokers reviewed in terms of the number of features and options available, featuring only 2 cooking grids and 3 temperature settings, but it’s enough for a small family picnic. 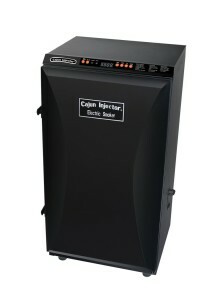 Cajun’s Injector used to have some high quality smokers on the market, but they failed to keep up with the other brands, especially when it comes to electric smokers. Only this particular model is a worthwhile purchase, featuring 5 smoking racks, two of which are dedicated jerky racks, an air damper, a hanger rack and a temperature probe. Can be purchased for around $200.